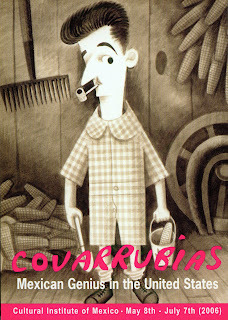 ComicsDC: Miguel Covarrubias portraits on display this fall. Miguel Covarrubias portraits on display this fall. The great Mexican caricaturist has material - "portraits of and by" - borrowed from the National Portrait Gallery in the exhibit "Mexican Treasures of the Smithsonian" in the underground Ripley Center from September 4 - November 11. 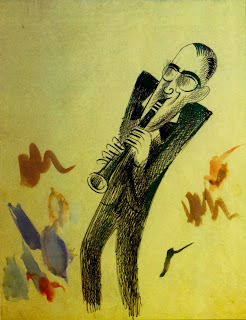 Miguel Covarrubias: Mexican Genius in the United States. Washington, DC: Cultural Institute of Mexico, May 3-July 7, 2006. 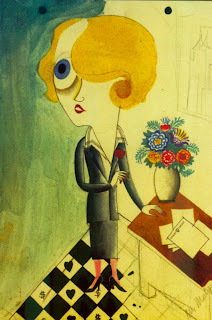 Covarrubias, while little remembered today, was a giant in magazine illustration and caricature from the 1920s though the 1940s. According to the promotional material for the exhibit, he illustrated for Vanity Fair, Vogue, The New Yorker, Fortune, Life and Time while also illustrating over twenty books. Surprisingly, he also did pioneering cultural anthropology research when he visited Bali with his wife in the 1930s. This exhibit also consists of two smaller shows. On the ground level of the building, an aging mansion, sketches and studies from the Universidad de las Américas were displayed in a set of unadorned side galleries off the lobby. The fifty-two sketches appeared to be studies for more complete work. They were mostly on cheap newsprint paper, and the identity of the subject was frequently lost except for the famous like Marlene Dietrich, D.H. Lawrence, Joe Louis, Walt Disney, and Benny Goodman. The sketches showed Covarrubias working with a quick, forceful stroke, and "Unknown Character" in the first room demonstrated that Edward Sorel must have been familiar with his work. In the final room of the galleries, two or three films were supposed to be showing, but none were. The press release listed two films by José G. Benítez Wall, A Mexican in New York (1997) and Miguel Covarrubias 1904-1957 (1996) and the wall text listed a third, A Master Artist's Trade (1997). Returning to the lobby, the visitor (of which I was the only one) could examine exhibit cases with published versions of some of his book and magazine work. Books he illustrated included non-fiction and non-cartoon works such as The Aztecs: People of the Sun. He wrote and illustrated Mexico South: The Isthmus of Tehuantepec (Knopf 1967) and drew striking maps and Olmec heads for it. In Fine Art Color Prints (Chicago: Peoples Book Club, 1945), Covarrubias contributed a very well done and very complex "Map of America" showing the distribution of natural resources. The exhibit cases also included Vanity Fair from June 1933 showing one of his series of Impossible Interviews -- "#18 Herr Adolf Hitler and Huey S. 'Hooey' Long versus Josef Stalin and Benito Mussolini." These Impossible Interviews were a major component of the second part of the exhibit, which was up four flights of red, fraying but thickly carpeted stairs, lined by mural scenes painted by Cueva del Rio from 1934-1941. The fourth floor held the exhibit Miguel Covarrubias: Caricaturista, curated in 2004 by Kathryne B. Tovo for Humanities Texas with the University of Texas' Ransom Humanities Research Center. It was not readily apparent if the original show consisted of all reproductions, but the traveling version did. Given the quality of Covarrubias' artwork, the use of reproductions was a considerable disappointment, especially since the Ransom Center appears to have had access to the original works. In spite of that, this exhibit was a good representation of the breadth of his career, and was very well-labeled with biographical information on his subjects including scientists and explorers like William Beebe and Richard E. Byrd. This regular feature paired two people who could not meet in real life in an imaginary conversation. Featuring such ill-matched celebrity pairs as a birth control advocate with the mother of quintuplets, a speakeasy hostess with the president of the Women's Christian Temperance Union, or a sultry Marlene Dietrich with moralist Senator Smith Brookhart, each interview offered rich potential for comic conversation and visual contrasts -- with the less respectable figure often achieving a slight edge. Sorel's debt to Covarrubias can again be seen in his recent similar series for the Atlantic Monthly collected as First Encounters: A Book of Memorable Meetings (Knopf, 1994). The time is overdue for a collection of these original Interviews. These rooms were filled interesting illustrations. Two especially worth noting were a skillful parody of Rockwell Kent that Covarrubias did in Kent's style in 1932, and an illustration of Walt Disney in Noah's Ark with all of his characters, done for Vogue in 1937. The Disney caricature was the finished version of the sketch seen on the first floor, and the failure to display the two side-by-side highlighted a disappointment of this exhibit. Overall, the show should have been better, but for those with little knowledge of Covarrubias' long and varied career, it was an adequate introduction to his work.